Today’s TeamDesk update features an ability to define record pickers for each relation and some UI reorganizations. First of all, default Record Picker options are moved from the Views section to Table Properties. By default all relations will use these options. Relation’s options were extended with Override default picker box. When checked, a section to override default record picker options is displayed. There you can set up the list of columns to display, filter and sorting. 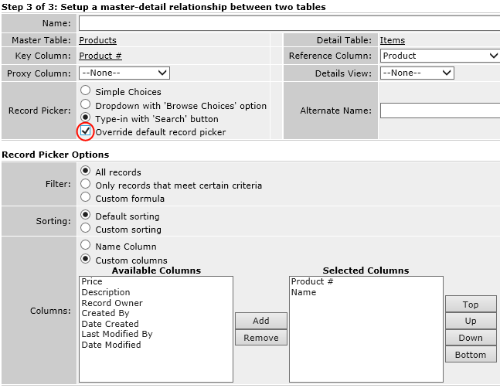 Having an ability to setup record picker for each relation eliminates the need to setup match condition between the column and the constant – you can remove these condition and add corresponding “column is (not) value” to a record picker’s or summary columns’ filters. Thanks, this will add a lot of flexibility. However, could you please give one “before, after” type example, specifically showing how that corresponding “column is / not value” could be added?